The grande dame of French cinema has suffered for her art — she nearly drowned during the filming of Leos Carax’s “The Lovers on the Bridge” — but the stuffy hotel room where she’s conducting interviews today has apparently pushed her to the brink. She’s referring to “Vision,” the new film from award-winning director Naomi Kawase. 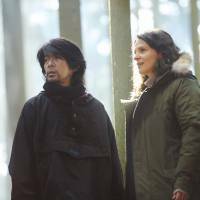 Binoche plays a French essayist, Jeanne, who journeys into the forests of Nara Prefecture to search for a mysterious herb that only appears once every 997 years. Once there, she falls into a relationship with a taciturn ranger, Tomo (Masatoshi Nagase), but it slowly transpires that she’s also mourning the loss of an earlier love. The project was born at last year’s Cannes Film Festival, where Kawase’s “Radiance” (“Hikari”) was screening in competition. When the director ended up sat at the same table as French producer Marianne Slot during an official dinner, they started plotting to work together. Soon enough, Binoche found herself embroiled in the plan. The actress was presenting the Palme d’Or that year, and her speech at the podium made an impression on Kawase. “Vision” was tailored to suit Binoche’s schedule. When it transpired that she would be available during September and November, Kawase opted to write a story that was split into two halves. The film’s location, deep in the mountains of the director’s native Nara, was chosen partly to satisfy the actress’s eagerness to see rural Japan. She stayed in temple accommodation for the duration of the shoot and spent her free time exploring the local culture, visiting a soy sauce factory and learning to make washi paper. Having worked everywhere from Colombia to Afghanistan, she says adapting to a Japanese movie set didn’t pose any problems. Only the scheduling came as a shock. Kawase started out as a documentary filmmaker and is known for the immersive approach she takes with her actors. Nagase mastered basic forestry techniques and spent a week living on location before shooting began. Glamorous screen veteran Mari Natsuki, playing a blind herbalist, goes so deep into her role that she’s nearly unrecognizable. “Vision” is one of Kawase’s most unabashedly new age films. Binoche’s character theorizes about the role of prime numbers in nature and delivers lines like “Death is part of a long sleep.” The dreamlike cinematography and sound design create a sense that the movie’s forest location is a place where the past and future are as tangible as the present. “She works more with the spirits than the reality of things,” says Binoche. At the end of the film (and spoiler-averse readers may want to skip to the next paragraph), it turns out that Jeanne visited the forest decades before and left her newborn child there following the death of the father. It’s a bizarre plot twist, like something out of ancient mythology. Asked if she sees any connection between Jeanne and the tragic characters she played in films such as Krzysztof Kieslowski’s “Three Colors: Blue,” she demurs. Next up, Binoche is due to work with another noted explorer of the human condition: recent Palme d’Or winner Hirokazu Kore-eda. Coming after her appearances in the Hollywood versions of “Godzilla” and “Ghost in the Shell,” would it be fair to describe this as the Japan phase of her career? “Vision” is now playing in cinemas nationwide.